Discussion in 'Sesame Street' started by FunnyBear, Mar 19, 2017. Julia, the autistic Muppet introduced in 2015 has officially joined the cast and will appear on Sesame Street's 60 Minutes live appearance tonight. 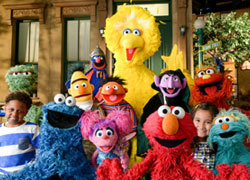 Sesame Street's YouTube channel has posted 6 video segments with Julia. I wonder Julia will met Alex (The muppet kid with a father in jail)? Holy crap, I didn't think SST could actually get worse at matting and keying, but gee! It's web-exclusive stuff; don't expect their A-game, production-wise. MikaelaMuppet and mr3urious like this. For all you who don't get HBO, the "Meet Julia" episode is going to air on both PBS and HBO, Mon. April 10th. So I take it this is a "Very Special" stand-alone special that's not part of the regular season then? It's still an episode; not sure what content there will be other than the story. That's fantastic to hear! I was literally just about to say how it was a shame kids without HBO had to wait so long to see Julia. I hope lots of people watch and we have a good discussion here. On a slightly unrelated note, I hope Segi comes back. She's a really important character too. I actually am on the autism spectrum. 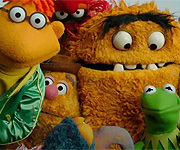 That being said, didn't they (unofficially) already have an autie character in the form of Bert?! Actually, that is a fair point when you think about it. Part of the point of Bert is to help kids respect different point of views and show them that something that might be small and boring to you can be super interesting to someone else. His obsessions with pigeons, oatmeal, collecting bottle caps and paperclips could all be interpreted as "special interests".